is the amount of increase in performance achieved per unit time per unit investment through artificial selection. a simple numerical indicator used to analyze remote sensing measurements, often from unmanned aerial vehicles, to determine a specific trait of the standing plant or of the crop. a predefined (e.g., FieldScanalyzer or Satellites) or adaptable structure (“phenopoles,” “phenomobiles,” UAVs, etc.) on which a sensor or combination of sensors may be mounted and integrated together to provide for mobility while maintaining precision and stability. a scientific devices designed to measure a specific crop morphophysiological trait of interest at a specific level of interest (leaf, roots, soil, canopy), either by direct contact (e.g., chlorophyll meter, porometer, etc.) or remotely (i.e., imaging sensors) by implementing a specific set of nondestructive measurements. 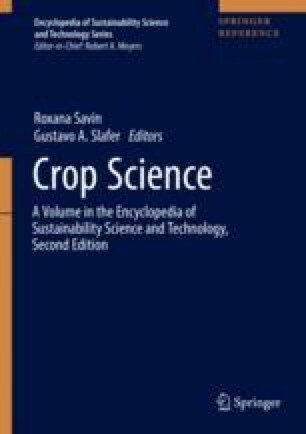 This review chapter was supported by grants from the CGIAR Research Program MAIZE (to J.L.A., S.C.K., J.E.C. and M.Z-A. ), the Spanish project AGL2016-76527-R (to J.L.A. and S.C.K. ), the Bill & Melinda Gates Foundation and USAID funded Stress Tolerant Maize for Africa project (J.E.C., M.Z.A., M.S.O) and the CGIAR Excellence in Breeding Platform (J.E.C. M.Z.A, and M.S.O. ).